Ah Mitsuko! 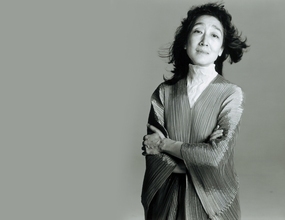 The impossibly stylish Grammy award-winning pianist Mitsuko Uchida graced the Queen’s Hall with a fearless rendition of Ravel’s Concerto in G in conjunction with the Scottish Chamber Orchestra. The piece begins with a whip-crack, and the jazzy first movement was an opportunity for the Japanese-born but naturalized Brit (and a Dame to boot) to showcase some virtuosic pyrotechnics at the keyboard. The long, irresolute lines of the second movement brought out all her warmth and musicality, the effect only slightly spoilt by the inevitable outbreak of coughing (though to be charitable it is a cold Edinburgh winter). The hacking had thankfully subsided in time for the solo encore. It sounded (to this untrained ear) like a Mozart, perhaps in A Minor, anyway it was utterly gorgeous and the only downside was that it didn’t last forever! But live music performance is ephemeral in a way that makes it different from all other art forms: a poem can be reread, a painting lingered over at the viewer’s discretion, but each note of a live performance is immediately fading away into nothingness. The effects of melody, harmony and rhythm are governed by their relationship with sounds that exist now only in the memory of the listener. Perhaps this is what can give it such terrible poignancy – each performance of a piece is a unique, timebound event. You can’t step into the same river twice, said Heraclitus. Not even into the same river once, replied a wise pupil. This concert took the audience on a journey through twentieth century France with three very different stylists. From the luscious love-and-death high romanticism of Faure’s Pelleas et Melisande, to the listen-to-this-new-sound-I’ve-heard of Ravel heralding the jazz age (the concerto was written after a tour to the US in 1928), to the uncertain, totally alienated and seemingly structureless (again to this untrained ear!) soundworld of Boulez’s trilling Memoriale reassure us as we headed out into the night we were suddenly returned to a world of balance, reason and optimism with Haydn’s ‘Clock’ Symphony. One always feels with Haydn as if one is being guided gently downhill to somewhere that you really quite wanted to go, perhaps a nice picnic, by a lake, with pretty girls, sunshine and good cheese. Splendid! The Scottish Chamber Orchestra under the baton of principal conductor Robin Ticciati played with all their usual verve and precision, the soloists (in particular flautist Alison Mitchell and bassoonist Peter Whelan) were superb and the evening as a whole was just a treat. Coming up the SCO are at the Assembly Rooms on Sat 14th Feb for a family afternoon concert, Chamber Sunday at the Queen’s Hall on the 22nd and again at the Queen’s Hall on Sat 28th for Brahms’ Serenade. Go and see them if you can.